Samsung is set to host the Galaxy A9 (2018) India launch event in New Delhi today. The event is slated to start at 12:30pm IST and will mark the entry of the world’s first smartphone with four cameras in the domestic market. Of course, the company’s official launch invite does not mention the handset by name, but the ‘4X Fun’ tagline clearly points to the Samsung Galaxy A9 (2018). Since its specifications are already known thanks to the global unveiling last month, all eyes will be on the Samsung Galaxy A9 (2018) price in India, variants, and launch offers at today’s event. The Samsung Galaxy A9 (2018) India launch event will be live streamed so that all the fans of the brand can join in on the action. The live stream will be hosted on the official Samsung India Newsroom and Samsung Bharat News websites. You can watch the stream in the embedded YouTube video below as well. The Samsung Galaxy A9 (2018) price in India will be Rs 39,000, as per the code on the company’s official website. However, media reports in the last couple of weeks have pegged it around Rs 35,000. Both these prices put it squarely in competition with the new OnePlus 6T smartphone. 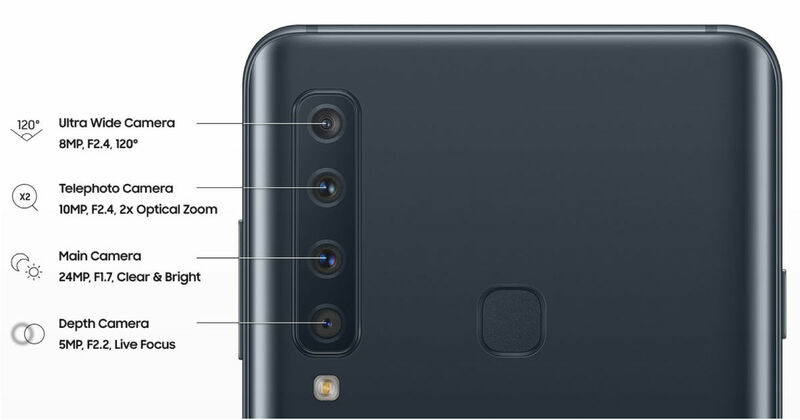 As for the specifications, the highlight of the Galaxy A9 (2018) is, of course, the four-camera setup on the back. This setup includes a 24MP primary sensor with f/1.7 aperture ad PDAF, an 8MP wide-angle lens, a 10MP telephoto lens with 2x zoom, and a 5MP depth sensor for bokeh images. There is also a 24MP front camera with f/2.0 aperture and HDR. The handset has a 6.3-inch Super AMOLED screen with full-HD+ (1,080 x 2,220) resolution and runs Android Oreo-based Experience UX. Under the hood, the new Galaxy A9 (2018) packs the octa-core Snapdragon 660 SoC, with 6GB and 8GB RAM options. It comes with 128GB of inbuilt storage and microSD card support up to 512GB. It has a fingerprint sensor on the back and Samsung Pay integration. As for the battery capacity, the smartphone comes with a 3,800mAh battery with fast-charging capabilities.